Due to the federal shutdown, the Washington Department of Fish and Wildlife (WDFW) has rescinded three razor clam digs at Kalaloch beach that were set to occur Jan. 19-21. 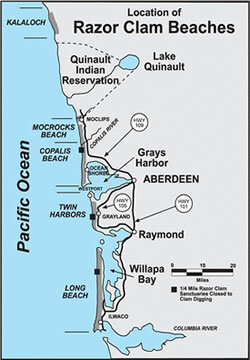 “We are closing Kalaloch beach to razor clam digging in response to a request by Olympic National Park,” said Dan Ayres, WDFW coastal shellfish manager. “Olympic National Park staff are not available to help ensure a safe and orderly opening in the area,” he added. WDFW and the Park will consider alternate days to make up for this loss of harvest opportunity following the current federal shutdown. Digs at three other beaches, Twin Harbors, Mocrocks and Copalis, will proceed as planned, said Ayres. State shellfish managers with WDFW approved those digs on evening low tides last week after marine toxin tests showed the clams are safe to eat. No digging will be allowed on any beach before noon. “Diggers should always keep an eye on the surf and come prepared with good lighting devices for the digs that occur after dark,” Ayres said. Ayres said the department has also tentatively scheduled a dig in early February, pending the results of another round of marine toxin tests. If those tests are favorable, that dig will run Feb. 1-3. More information on planned digs can be found on WDFW’s razor clam webpage athttps://wdfw.wa.gov/fishing/shellfish/razorclams/. All diggers age 15 or older must have an applicable 2018-19 fishing license to harvest razor clams on any beach. Licenses, ranging from a three-day razor clam license to an annual combination fishing license, are available on WDFW’s website at https://fishhunt.dfw.wa.gov and from license vendors around the state.